The ubiquitious Vulture Fighter was a constant threat to the Old Republic. While individually not much of a threat, their inexpensive consturction, limited endurance and cheap droid brains meant that they could be afforded by the thousands. There was no such thing as a single Vulture fighter. 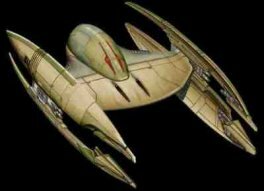 Indeed, for most of the Clone Wars, a small deployment would have been 100 of them. Require Control. Only have an endurance of six combat turns then must refuel.